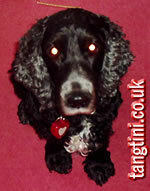 Holly aka Hollyberry of Midnight was our very first English Cocker Spaniel. We picked Holly and Scooby up on 1 April 1994 and from that day we fell in love with them both. They were always very amusing and got into a lot of mischief. Holly was a solid black cocker and was a joy. Her tail never stopped wagging and she was always a very merry little cocker. She was always full of life and totally ruled the roost, poor Scooby never stood a chance. The two of them were totally devoted to each other and followed each other everywhere. They were so close it was devastating for all of us when we lost Scooby in February 2006. Holly suffered greatly after his death and would not leave our side. We thought about it long and hard and decided that she desperately needed a new companion. Eventually we found our Tango and she certainly gave Holly a renewed zest for life.